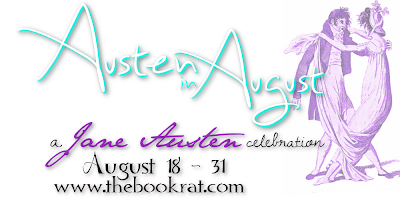 The Book Rat: Friday Face Off: Austen in August Style — guest post from Cecilia Gray! Friday Face Off: Austen in August Style — guest post from Cecilia Gray! So far, Cecilia has made her opinions known in our Janeite conversations, showed us that P&P is always on beat, and shared some delicious Austen kisses (ooh, scandalous!) -- but today. . . today, she's starting a war. That's right, she's taking over Friday Face Off and asking our very own Austen gals to duke it out (via you, so get your (fancy, kid) gloves on) to find out who's the best of the best at doing what they do. Weird as what they do may be. . . 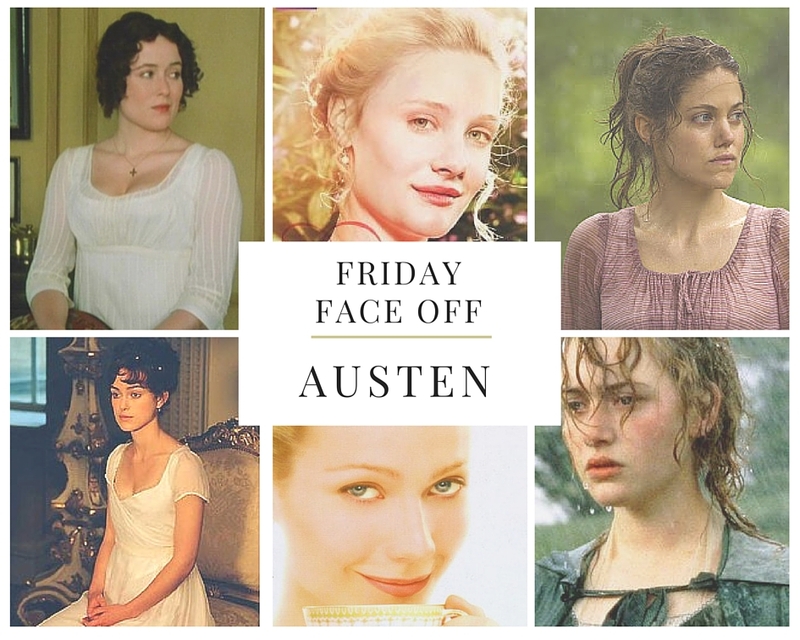 If you're new to Misty's blog, Friday Face Off is her version Who Wore It Better, and we're going to do it Austen Style! Below are two sets of images, representing three of Austen's heroines. Images on the top are from British television adaptations. Images on the bottom are from studio films. There is no preset criteria – judge by who looks the part best, who you like the most, who is closest to your ideal, whatever and however you think that Austen's characters should be judged. Vote for your favorite on the comments! Vote by letting us know your pick, in whichever way works for you (top/bottom; BBC/Hollywood; actress' name)! Ooh judging women, as if I ever... ah hell, who am I trying to kid, I love to do that. So, I have only seen the two P&P movies, and while I think Keira looks simply drop dead gorgeous in everything she plays, I found myself drawn more to Ehle's portrayal of Austen's best known. The others I'm afraid I can only judge by their looks (and am shallow enough to do so), therefore my Emma would be Gwyneth. For Marianne Dashwood it's a tough decision, Kate Winslet is a lovely actress, but going by the pictures above, gosh, can't resist a beautiful brunette, so here my vote goes to Charity Wakefield. I do do do do love Keira's hair! I've tried to recreate it but was not successful. Well, this will be easy for me. Mostly. The whole top row got my vote. Kate as Marianne was the only one that gave me pause. But I digress - while I liked Kate as Marianne in spirit, for some reason, the sisterly bonds felt more genuine/sweeter in the other version. Hmmm. I prefer the movie of P&P, but Ehle is better at the wistful for sure. Hands down the BBC one for Emma. I can't stand Gwyneth's version. As for S&S, can we have a tie? I can't choose. I loved both equally. Definitely the top two for P&P and Emma. The BBC versions win in a landslide in my opinion, but for S&S how can I choose? That is a toughie! I'm trying not to let my familiarity with the actual adaptations themselves sway me BUT I go for the British TV adaptations (top row) on all three characters. I have a difficult time viewing these Regency country ladies as the whispy ingenue actress form/figure/complexion. I love both versions of P&P so that's hard! I would have to go with top row across the board.. I do however love Kate in S&S. Bottom for P&P. Top for Emma. Bottom for Mariane.